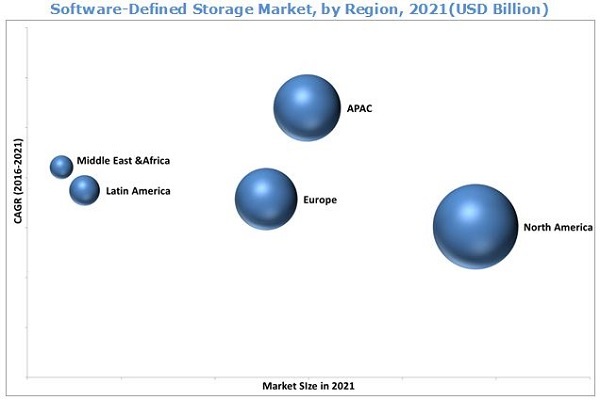 [167 Pages Report] The Software Defined Storage market size is estimated to grow from USD 4.72 Billion in 2016 to USD 22.56 Billion by 2021, at a CAGR of 36.7%. The SDS market has potential scope for growth in the years to come due to its advantages over traditional storage system both in terms of functionality and cost effectiveness. Exponential growth in volume of data across enterprises, rise in the “software defined” concept, and need for cost optimization in data management are some of the major driving factors for the market. The base year considered for the study is 2015 and the forecast period has been considered from 2016 to 2021. The objective of the study has been to define, describe, and forecast the global Software Defined Storage market on the basis of platform/solution, service, usage, organization size, application area, and region; analyze the opportunities in the market for the stakeholders, and detail the competitive landscape for the market leaders. The Software Defined Storage market ecosystem comprises standalone SDS providers with a server or platform such as VMware (California, U.S.), Fujitsu (Tokyo, Japan), and IBM (New York, U.S.); software technology vendors with server or platform such as Scality (California, U.S.), Nutanix (California, U.S.), and EMC (Massachusetts, U.S.); and hardware providers with server or platform such as Seagate (California, U.S.) and Intel (California, U.S.). The global Software Defined Storage market is expected to grow from USD 4.72 Billion in 2016 to USD 22.56 Billion by 2021, at a Compound Annual Growth Rate (CAGR) of 36.7%. The main driving factors for the growth of the market include exponentially growing data volume across enterprises, rise in the “software defined” concept, and need for cost optimization in data management. Among SDS software, the SDS controller software simplifies and automates storage, abstracts underlying complex storage infrastructures, enables monitoring of stored data, and optimization of the entire datacenter infrastructure. This software is expected to gain the maximum traction in the market during the forecast period. The function of controller software allows it to automate network management while making it easier to integrate and administer business applications. Therefore, the demand for SDS controller software solution is rising continuously. In the SDS services segment, the security, and support & maintenance services are expected to grow at the highest CAGR, whereas training and consulting is the largest contributor among all the services. Security service is expected to grow rapidly as it is required to mitigate software-defined data center threats and ensure secure sharing of data between business units, partners, and customers, while alleviating lateral moving threats and advanced attacks. Among application area segment, the telecom and ITES sector is expected to be the second largest contributor during the forecast period. This sector needs to store large volumes of data as every day new data is generated that needs to be stored and kept secured. The telecom and IT sector is hugely customer centric and customer service plays a significant role in retaining customers. These customer service centers need to have access to customer information and store the new generating data. SDS solution fulfills the storage and management need of the ever-increasing data volumes in the sector. Asia-Pacific (APAC) is expected to be the fastest growing region during the forecast period, as the region is expecting technological advancement with the increasing IT number of companies. Also, the Small and Medium Enterprises (SMEs) in the region are keen on reducing their IT spending by seeking storage virtualization facilities. North America is expected to lead the Software Defined Storage market as the governments in the region have initiated many projects related to digitalization of their countries, which is making the region the largest adopter of SDS solutions. The absence of skilled workforce for effective deployment of SDS infrastructure and security & reliability concerns in virtual cloud storage are the factors hindering the growth of the Software Defined Storage market. There is a need to educate the customers and define the actual importance of SDS. SDS vendors need to offer improved solutions that reduce the risk of storing the data on cloud. Dell, EMC Corporation (Massachusetts, U.S.), Fujitsu (Tokyo, Japan), HPE (California, U.S.) , IBM (New York, U.S.), Citrix (Florida, U.S.), NetApp (California, U.S.), Scality (California, U.S.), VMware (California, U.S.), and Western Digital Corporation (California, U.S.) are identified as leaders in the Software Defined Storage market, whereas Atlantis (California, U.S.), DataCore (Florida, U.S.), Ericsson (Stockholm, Sweden), Intel (California, U.S.), Maxta (California, U.S.), Microsoft (Washington, U.S.), Nexenta (California, U.S.), Nutanix (California, U.S.) Pivot3 (Texas, U.S.), and SwiftStack (California, U.S.) are identified as key innovators in the market. The companies have majorly adopted the strategy of partnership, alliance, and collaboration to achieve growth in the Software Defined Storage market. 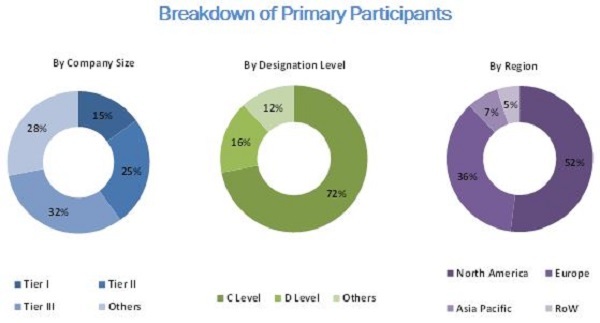 The strategy of new product launches & enhancements and mergers & acquisitions accounted for 41% and 15%, respectively, of the total strategic developments, in the global SDS market.